The learning ecosystem has never been as dynamic in terms of content or tools as it is today. More than a fixed environment, the word ‘ecosystem’ by definition implies complex interactions and continued growth among a set of functions supporting a business. Every organization has a learning ecosystem, whether it was purposefully designed or left to develop organically. And each falls into a different level of maturity that is largely defined by the level of connectedness and structure of learning resources. In the learning ecosystem maturity model below, the top describes the connectedness of ecosystem technologies, while the bottom describes the maturity of the L&D function within the business. While few organizations will fall neatly into one of the following buckets, the model will give you an idea of where you stand currently and what your path to maturity might look like. More and more, learning ecosystems are being designed to scale learning and knowledge sharing across organizations, while empowering employees to take the lead in their own learning journeys. And many organizations will agree that video has been essential to making it happen. Building a learning ecosystem that supports a culture of continuous learning has become a top priority for today’s Learning and Development (L&D) leaders. And for many, that means finding the right mix of people, processes, and tools to support the 70:20:10 framework for experiential, social, and formal learning. Of course, no two learning ecosystems are alike, but there is one similarity that has emerged recently among mature learning organizations — they’ve built learning ecosystems that include video technologies that can improve engagement and help scale access to knowledge across teams and locations. Maximizing learning (both informal and formal) means creating on-demand learning resources in formats your people will actually want to use. According to Forrester Research, employees are 75 percent more likely to watch a video than to read documents, emails or web articles. This means that video has a crucial part to play in creating the right level of engagement with learning content. One of the most important things video can offer is the vital presence of a trainer or subject-matter expert that other formats lack. Having a presenter, even when recorded, helps learners concentrate on material more effectively and allows them to better absorb important concepts. Face-to-face, instructor-led training (ILT) has long been the dominant method used to deliver employee training and development. The advantages of learning directly from experts are clear: instructors can easily adapt to learners’ needs, learners focus more on the subject materials, and learners have the ability to receive immediate feedback. The drawbacks, however, are just as clear. Instructor-led training is a huge expense, and overwhelmingly, employees dislike being asked to force fixed-schedule classroom training into their already-overbooked calendars. Video enables organizations to expand access to valuable instructor-led training while also making formal learning programs more flexible and personalized — all while helping you stick to your training budget. Simply record your live training events and upload them to a secure, searchable video library. With on-demand access to virtual instructor-led training, your organization can reduce the number of ILT sessions it hosts for each subject and broaden your training initiatives to include new courses you wouldn’t have otherwise had the resources to support. Most social learning occurs organically between coworkers who often work in close proximity to each other. It’s those quick “got-a-minute” conversations that happen when information is needed the most that account for 20 percent of learning at work. But how, then, do you ensure those important social learning moments are possible among coworkers who work in different offices or in different time zones? Video conferencing software enables real-time collaboration when two people can’t be in the same room. But grabbing one-on-one time or scheduling a walk-though with a lead can still be challenging with busy schedules, more people working remotely, and when teams are in different parts of the world. That’s where on-demand video comes in. Anyone in your organization can quickly create a tutorial, demonstration, or an explainer video to share knowledge with the entire company simply by pressing “record” on their laptop and presenting. That’s exactly what Synaptics did. Within the first year after the company launched its new searchable video platform, it calculated that those videos had already helped the company to save more than 7,000 hours in employee productivity. Managers play a crucial role in building a culture of learning, as coaches, mentors, and learners themselves. Effective learning ecosystems engage managers in their roles supporting the learning and development of their direct reports. With video, managers can quickly capture and share their own subject matter expertise, guide their teams through learning simulations, provide virtual feedback on employee interactions and communications, and find other ways to deliver coaching even when they can’t always be in the same room at the same time with their subordinates. And just as importantly, searchable, on-demand video learning materials give managers the flexibility to continue their own learning amidst busy schedules and competing responsibilities. Live in-class training and one-on-one informal learning moments can’t provide the same type of insights about the learning that’s happening in your company that video can. With video engagement analytics, L&D teams get valuable information about which training sessions are most popular, which are least popular, which parts of each session are viewed the most or the least, and what content employees find valuable enough to bookmark. It’s information that can help improve future courses and training offerings, and enable L&D leaders to measure engagement with learning resources company-wide. With all of the ways companies can leverage video in their learning operations, the dominant technologies used in many learning ecosystems simply don’t do enough to support video. The places people currently go for knowledge in your organization — your learning management system (LMS), social sharing apps, your internal employee portal, and your customer relationship management (CRM) software — simply aren’t built to make sharing and searching of large video files easy. At a structural level, video is different from text-based learning resources. Video files are large and come in a variety of file types, which can make them difficult to ensure they’ll play as expected on every possible device your employees might use. At the same time, while hitting Control+F will enable you to quickly search through any text document, most systems’ support for searching video content is far more limited, requiring you or a member of your staff to manually tag every important detail and keyword. And last, few if any of your other systems will be able to provide detailed analytics about viewer engagement and viewing trends. With so many weaknesses when it comes to supporting video with other solutions, it makes sense why more and more top learning organizations have added a video platform to their learning ecosystems. Doing this would be comparable to toting around a laptop, WiFi hotspot, mp3 player, digital camera, GoPro camcorder, GPS tracker, and telephone — it no longer makes sense to carry all that equipment separately when you can get all those tools and more in a single smartphone. It’s expensive and inefficient to manage video this way. Today, you only need one single video technology to enhance employee learning and development: a video platform. A video platform simplifies video, making it possible for anyone with the right permissions inside an organization to record, edit, share, and search video-based knowledge. And by integrating a video platform into your other learning systems, you ensure your entire video library can be accessed where your people already go to get and share information. With flexible video recording and editing tools included in your video platform, anyone in your organization can record and share know-how and expertise in a high-definition, multi-camera recording that shows and tells every detail — in far less time than it would take to write up a written guide to the same subject matter. Panopto’s video platform, for example, enables your people to capture video of themselves presenting, video of their screen or screens, and PowerPoint slides at the same time. That means anyone in your organization can create a quick and detailed video tutorial that can be viewed by everyone in your company on-demand. A video platform that integrates with video conferencing systems and conference room AV also makes it easy to capture knowledge and ideas shared in meetings. Meeting recordings are a great way to capture every word and detail exchanged in a collaborative session, freeing people from taking notes and providing a valuable resource to anyone who couldn’t attend or who came onto a project later. Today the biggest challenge for businesses using video to support learning isn’t figuring out how to record new videos — it’s finding a way to securely host and share those videos. A video platform functions like a private YouTube just for your organization, making both uploading and sharing video easy for everyone. Every video that’s uploaded to a video platform is automatically transcoded into broadly accepted file formats, so anyone in your organization can stream your videos on any device simply by clicking a link. And a video platform is built for streaming video — much like how video is streamed on Netflix or YouTube, a modern video platform will adjust to accommodate a viewer’s network connection and device to deliver the best possible quality video playback with minimal buffering. Unlike YouTube, however, a video platform also gives you detailed control over who can access your videos. For sensitive information like employee training, process explainers, expert knowledge, internal meetings, and other communications, security is often of utmost importance. In Panopto’s video platform, your videos are private by default. If you want to share them publicly or with specific people, you simply change the sharing settings for a specific video or for an entire folder of videos. In the past, the one advantage text documents had over video content was that every word could be searched. Today’s video platforms, however, make it possible to search every word spoken or shown inside your videos. Any video-based knowledge in your library can be searched just like a text document or email. That means that someone can even find and instantly fast-forward right to the exact part of an hour-long training session where a relevant topic was discussed. With Panopto’s video platform, every video uploaded to your library — whether it was recorded with Panopto or not — is indexed for search. Panopto’s SmartSearch uses automatic speech recognition technology to capture every word spoken and optical character recognition to capture any words shown on the screen on in slides. So your workforce can instantly search and find information inside your formal training videos, employee-generated video tutorials, internal meeting recordings, and even important internal communications. 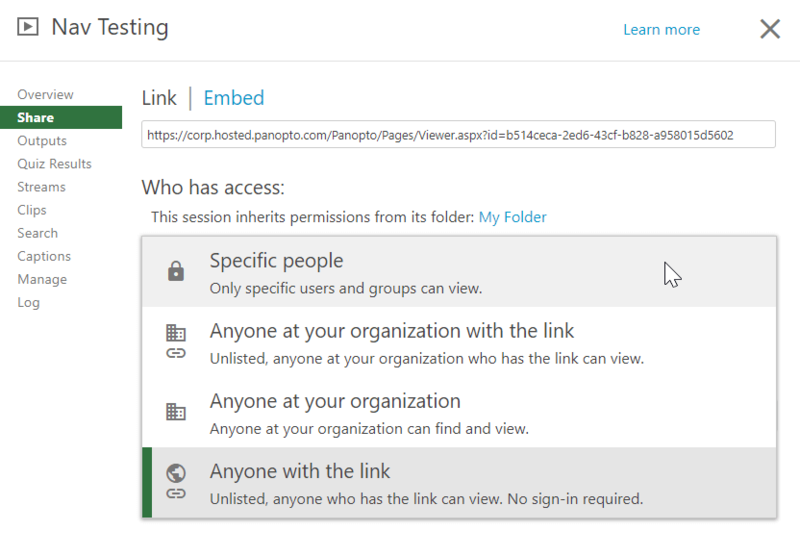 Care to try SmartSearch in Panopto for yourself? While traditional content repositories provide limited information on video viewing trends and engagement, a video platform can provide a much richer source of information. User analytics in a video platform can show you who’s watched what and where they stopped watching minute-by-minute, enabling you to confirm virtual attendance in a course, as well as completion. Meanwhile, aggregate data for training videos enables instructors to see where engagement tends to drop off. Sizable dips in viewership can help instructors pinpoint segments they may want to rework. Conversely, if employees search for specific ideas and begin watching a video at a particular point, trainers will see that spike as well. In addition, many video platforms provide instructors with other insights through direct engagement with employees. Within the video, employees can ask questions and participate in threaded discussions. This often provides instructors with feedback that helps identify parts of a course that aren’t connecting with the audience, or are of particular interest. To truly make video a part of your learning ecosystem, your video platform needs to integrate with your other tools and systems. Developer APIs and out-of-the-box integrations for LMSs, CRMs, video conferencing systems, and more all ensure that your organization can get the maximum benefit from using video. An integrated video platform brings video into your existing knowledge portals, making videos easy to search, easy to share within your learning ecosystem, without requiring employees to log in to another tool. And many video platforms can also share video viewing data with other systems such as your LMS via SCORM or even a custom-built system via APIs. Ready To Add Video To Your Learning Ecosystem? 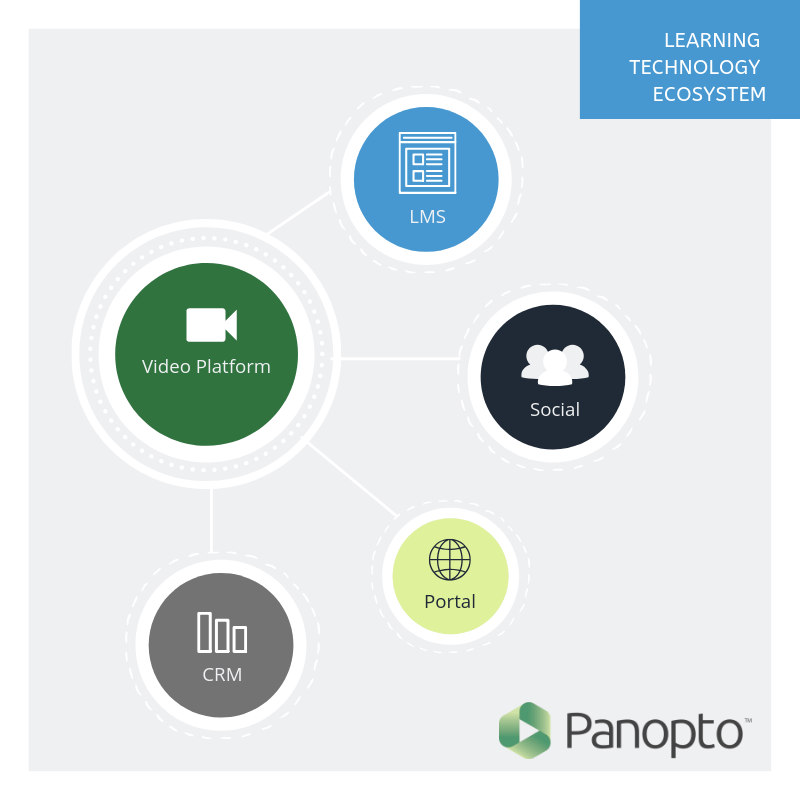 Panopto is the leading video platform for learning, offering businesses easy-to-use tools for recording, editing, streaming, and searching their internal video content. Try it for yourself — contact our team today to request a free trial and personalized demo.